How to detect WHDLoad files? Hi to everybody, long-time Amiga fan here! I've installed FS-UAE 2.9.7dev4 on Linux Mint 19.1 and I copied all my ADF and WHDLoad collection into a local folder. Everything went fine with ADFs after updating File Database, FS-UAE correctly showed all my games in the list, but no WHDLoad variant was detected, every game shows the ADF variant only. I tried various WHDLoad formats (zipped LHAs, normal LHAs, raw folders with WHDLoad files, ...), nothing is detected by FS-UAE... did anyone have similar problems? Try downloading a file from http://www.whdownload.com/ and mount it as a harddrive zip file. It should add the whdload parameters automatically which will include the slave file. Mmmh, good suggestion, that worked indeed, I tried with Turrican II (1.5) and FS-UAE detected it! So, the correct WHDLoad format seems a .zip file containing a .info file together with a folder with game files. I downloaded WHDLoad collection from EAB FTP server, but they are all in .lha format, did I get the wrong package from there? The WHDownload zips are very outdated. FS-UAE supports lha compressed archives too. The EAB FTP file server has always the latest versions. Not sure if Frode already support most of them. edit: Just checked. Turrican II v1.7 is detected via lha archive. Last edited by Retro-Nerd; 13 April 2019 at 17:08. There are many places in EAB server where to get WHDLoad (Game/WHDLoad, Retroplay/WHDLoad, WHDLoad_Packs, etc...), can you recommend the one supported by FS-UAE? Only use the ones Retroplay preinstalled.Make sure you have the latest files. He made a complete reinstall of all games in 2017+all the newer updates till today. I downloaded the Retroplay WHDLoad latest collection in .lha format (I ended with a folder for every alphabet letter), I added it to the FS-UAE File Database and then I updated the Game Database with my OpenRetro Account. That's strange, it's detected properly here in FS-UAE 2.9.7dev 4. Mmmhh it's strange, indeed... what format are you using for WHDLoad? You mean the archives? Just the ones Retroplay uploaded to the EAB File Server in lha. 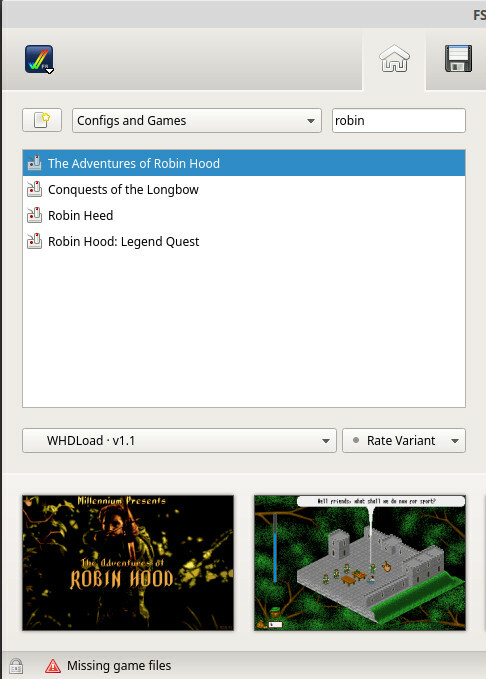 WHDLoad itself is automatically downloaded via FS-UAE launcher.